'Ontare', the James Alonzo Blair Sr. estate designed by Carrere & Hastings c. 1910 in Oyster Bay Cove. 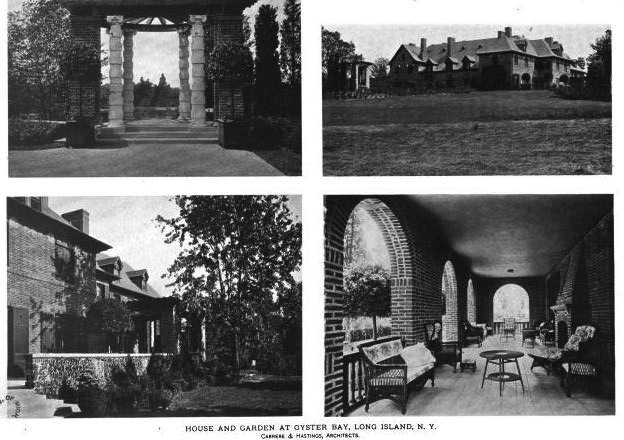 J. Clinton Mackenzie designed the estate's barns. Blair was a founding partner of the investment banking firm of Blair & Co. The interior of the house has since been split into two homes and continues to function that way today. Click HERE to see 'Ontare' on google earth and HERE on bing. Click HERE to see James A. 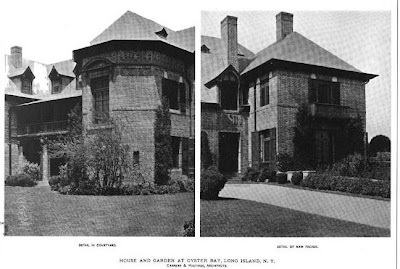 's brother C. Ledyard Blair's 'Blairsden' estate by Carrere & Hastings in New Jersey. An upper crust semi-detached home? Too bad this concept was not explored more often for other properties, but I presume if one is intent on spending a tidy sum on an estate, one doesnt want a party wall separating you and your neighbor, although todays gated communities and condo developments have changed that thinking. House looks well taken care of and the outbuildings appear to have new lives as well. 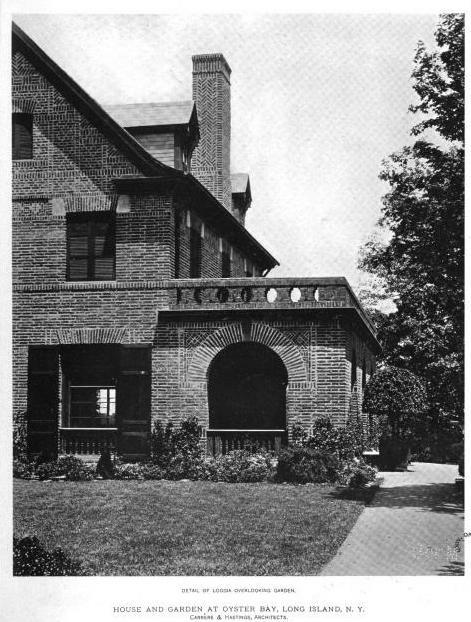 Great details and exterior brickwork. The home is close enough to the road that you can appreciate this home very well. There's a link to a color photos at the wikimapia link. Very off topic..........I saw today that Muttontown completed the restoration of the Knollwood gates (The Charles Hudson estate) over this past weekend. The restored/rebuilt iron entrance gates, remounted on the cleaned stonework, looks very well done. Compliments to the town for actually preserving what was deteriorating rapidly, but sadly it only serves as a reminder of what was lost just behind those gates. Here are a few color photos of this great estate. I find it interesting that it is between two roads. They must be quiet streets. It's too bad I'm not living in the area. I would be doing a lot of wondering around. Interesting house. James Blair was the son of Ledyard Blair of 'Blairsden', also by Carrere & Hastings, was he not? 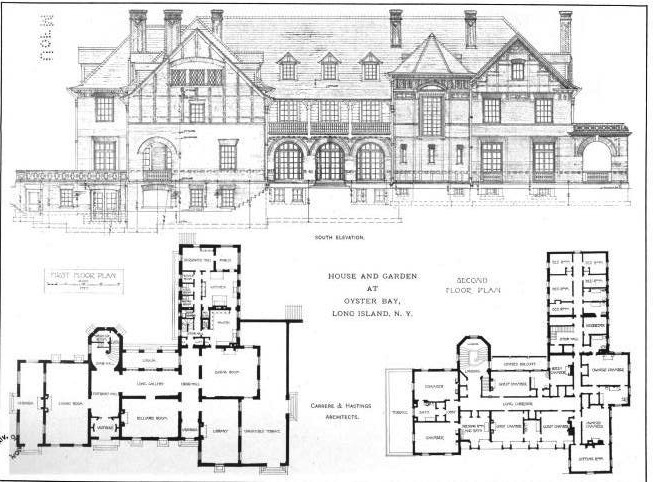 (Blairsden, for those who don't already know, is currently for sale, after what looks like a really good restoration by the man who also owned the Cook mansion by McKim, Mead & White, adjoining the Payne Whitney mansion on Fifth Avenue). Ahhh Blairsden, spectacular home and setting, was also owned by the Sisters of St John the Baptist, who used the home as a novitiate, as well as the JP Morgan residence on East Island, in Glen Cove, NY, before taxes and lack of candidates forced the selling of both homes. The Blairsden entrance drive is also quite spectacular with some neglected stone fountains and pergolas now sitting forlorn along the roadside. 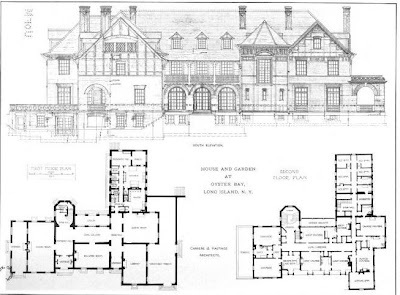 Nice house & nice that it could be divided with little exterior change & each half likely keeping two large, original public rooms – living room & billiard room on one side; dining room & library on the other. The question is: where are the kitchens? The front door to the dining room / library side enters in what used to be the butler’s pantry & I’m guessing the original dining room became the living room & the library stayed the same … so where’s the new dining room? In the living room / billiard room side I’d bet the kitchen took over the hall outside the billiard room plus that small loggia. If anyone has first hand knowledge I’d be interested to know. Thanks. C. Ledyard Blair only had daughters. James Blair was either a brother or a cousin. Indeed, Blairsden would make a wonderful estate to own. 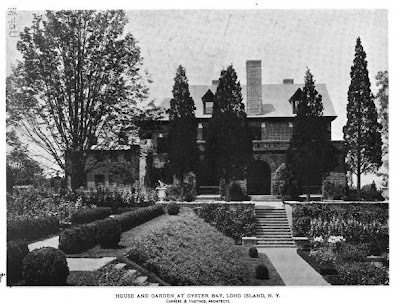 The house looks good, but the main hillside garden needs to be restored, especially the vertical cypress on either side of the stairs. According to Spinzia Blair was the son of DeWitt C. and Mary Ann Kimball Blair of Hope, NJ. OOPS!!! I meant brother! Really I did. I wasn't paying attention (and in fact, correctly say 'brothers' later in my comment, when linking to their parent's summer house at Bar Harbor (which the brothers retained until the mid 1930's, when they had it demolished and sold the property. Across from the silver cleaning room is the pot closet (opens into the kitchen) & the room below that (opening into the pantry) is the silver safe. Nice to know there was a proper separation of work areas. And the brick work on this house is impressive! So long as you have the pot closet opposite, I'm sure you'll be fine. I've always been entranced by a quote in a 1961 book 'Newport, Pleasures & Palaces' by Nancy Sirkis. 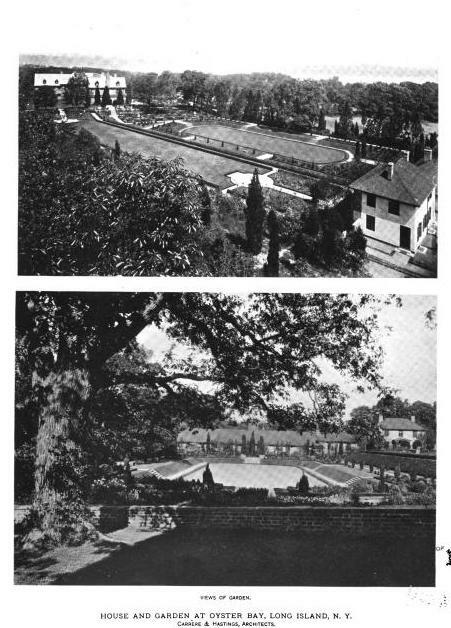 In a chapter about the otherwise apparently horrid Mrs. James Laurens Van Alen of Wakehurst, Sirkis quotes Mrs. Van Alen as saying that her house is the last in Newport 'to be run properly', with a staff of 23 servants, a ballroom lit only by 146 candles (although photos in the book of said room show it clearly to have electric picture lights over the English portraits), no one ever appeared at her balls in short evening gowns, she had her own French chef, and that while it would all end someday, in the meanwhile, in her household, there was a man whose sole responsibility it was to polish only the brass. And elsewhere in the same book, Miss Sirkis recounts asking Miss Wetmore of Chateau Sur Mer's butler to set more silver upon the dining table for the sake of composition. The butler refused, as the table was 'properly set for luncheon', and that further, were he to add more silver, he would then have to go upstairs and change into his evening livery. I wonder how much it cost to heat a place like this. Does anyone have any idea? I suppose, though, if you can afford to buy it, the cost of heating isn't a consideration. Hi, in the larger "half" of this home it went: library, dining room, foyer, sitting room, butler's pantry/original kitchen. You're right; few alterations needed to be done to transform this into a split residence. You would never know we have neighbors. The sitting room was repurposed to enlarge the size of the kitchen. The butlers pantry is now a dining room.The original dining room became a formal living room and the library stayed a library/den. Do you have any more info? My college roommate grew up in the house. I visited several times. The rooms were spectacularly proportioned and gracious.